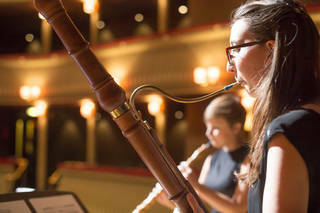 The Royal College of Music will be presenting live concerts in the Museum including Street Scenes, a new work by student composer David Evans, and György Ligeti’s 6 Bagatelles. David Evans’ Street Scenes (2017) takes inspiration from the worlds of art and cinema, evoking portraits of 1920s Berlin by artist Ernst Kirschner and Bernard Hermann’s soundtrack for Alfred Hitchcock’s film Psycho. György Ligeti’s 6 Bagatelles for wind quintet, a transformation of his experimental piano piece Musica ricercata. Come and see the performances as they transform the V&A’s Tapestry Gallery.